Provisional Korce stamps, for what would soon become the Autonomous Albanian Republic of Korce, were first issued in 1914. 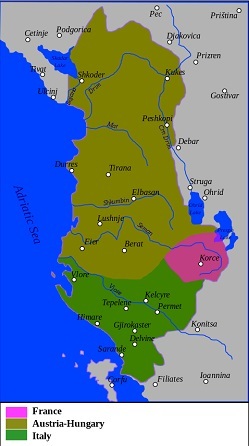 The Korce region of Albania had been "liberated" from the Ottoman Turks by the Greek Army in 1912, after which it was annexed to the Greek state of Northern Epirus. In 1916, the Korce region was again liberated by the French Army. The new autonomous government re-established Albanian as the official language. Greek schools were replaced with Albanian schools, which had been prohibited during the Greek administration, and a French school was also established in the newly liberated region. Of interesting note ..... One of the students at the French school in Korce was eight-year-old Enver Hoxha (1908-1985). He would later rise to political power as the First Secretary of the Albanian Party of Labor, in 1941, and he would eventually become the head-of-state of Communist Albania, ruling until his death in 1985. A little on the interpretation of the Albanian word here .... The name of the town and region, in Albanian, is actually "Korçë" or "Korça". I have also seen it referred to by the Bulgarian "Goritsa" and the Greek "Koritsa". In the Slavic languages, the word means "Hill". The Albanian word is pronounced something like "Korcheh" in English phonetics. For the purposes of this web page though, it will be written as "Korce". The two hand-stamped provisional Korce stamps shown above were issued during 1914. The paper varies, as these were hand-stamped directly onto the cover. Some of them were also produced in sheets, but examples of those are very rare. The design consists of the double-headed Albanian Eagle and the French inscription "COMMISSION DE CONTROIE PROVISOIRE / KORCA" (English: "Provisional Control Commission / Korce"). 10 Pa. (1914 - Sc. #52A) - Violet & Red, Black & Red. 25 Pa. (1914 - Sc. #53) - Violet & Red, Black & Red. And of course, as with anything having value, forgeries are abundant. 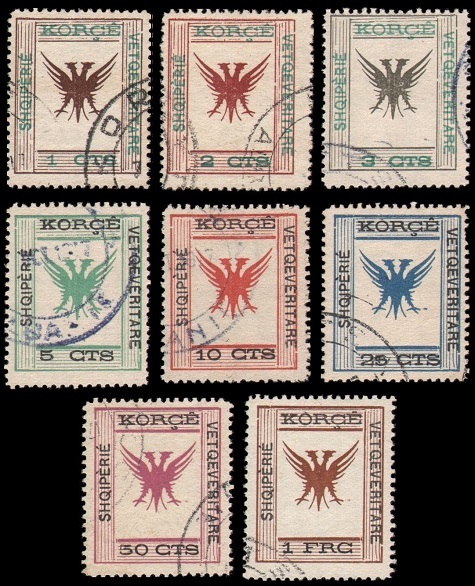 The eight provisional Korce stamps shown above were issued in 1917. They are typographed & lithographed, and they are perforated 11 1/2. The central design features the double-headed Albanian Eagle. The Albanian inscriptions on these stamps are "KORCE / SHQIPERIE / VETQEVERITARE" (English: "Korce / Albanian / Autonomous" Republic). 01 C. (1917 - Sc. #54) - Dark Brown & Green. 02 C. (1917 - Sc. #55) - Red & Green. 03 C. (1917 - Sc. #56) - Gray Green & Green. 05 C. (1917 - Sc. #57) - Green & Black. 10 C. (1917 - Sc. #58) - Rose Red & Black. 25 C. (1917 - Sc. #59) - Blue & Black. 50 C. (1917 - Sc. #60) - Violet & Black. 01 F. (1917 - Sc. #61) - Brown & Black. 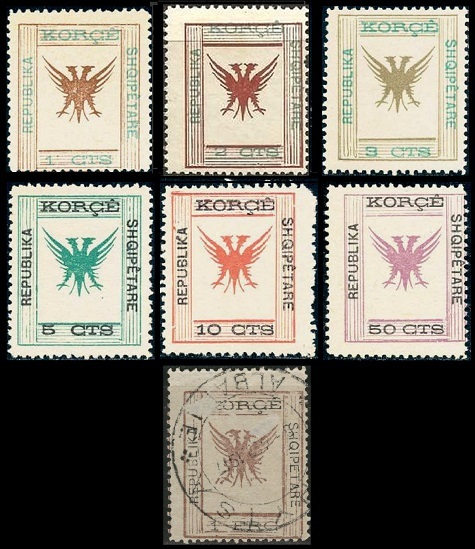 The seven provisional Korce stamps shown above were issued between 1917 and 1918. They have the same attributes as the previous set. The new Albanian inscriptions on these stamps are "KORCE / REPUBLIKA / SHQIPETARE" (English: "Korce / Republic" of "Albania"). 01 C. (1917 - Sc. #62) - Dark Brown & Green. 02 C. (1917 - Sc. #63) - Red Brown & Green. 03 C. (1917 - Sc. #64) - Black & Green. 05 C. (1917 - Sc. #65) - Green & Black. 10 C. (1917 - Sc. #66) - Dull Red & Black. 50 C. (1917 - Sc. #67) - Violet & Black. 01 F. (1917 - Sc. #68) - Red Brown & Black. This may seem incredible, since the first eight stamps above all catalog under $18.00, and all but one of the seven stamps directly above catalog under $8.00, but .... Forgeries of all of these stamps are abundant. The professional counterfeiters must have REALLY BEEN DEDICATED to their "art" to do this! An overprinted and re-valued 5 C. denomination stamp, from the set described above, was issued during 1918. 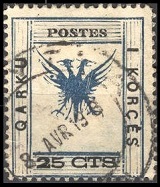 The red overprint on the stamp is "QARKU I KORCES" (English: "Korce Region"). 25 C. on 05 C. (1918 - Sc. #80) - Green & Black. This overprinted stamp is rarely seen in the philatelic marketplace. I looked all over the internet for a suitable scan of the stamp to use above, but I could not find anything! The 25 C. denomination provisional stamp shown above (Sc. #81) was issued in 1918. The attributes of this stamp are the same as those of the other provisional stamps of this type. The Albanian inscription is "QARKU I KORÇES / POSTES" (English: "Korce Region Postage".